Cairo (Arabic: al-Qāhirah) is the capital of Egypt. Cairo is the 16th-most-populous metropolitan area in the world, with a metropolitan area population of approximately 15.2 million people. 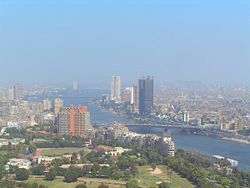 Cairo is located on the banks and islands of the Nile River in the north of Egypt, immediately south of the point where the river leaves its desert-bound valley and breaks into three branches into the low-lying Nile Delta region. The modern city is located near the ruins of Memphis, the capital of Ancient Egypt, which was founded around 3100 B.C.E.. The first settlement on the location of modern Cairo was a Roman fort, known as Babylon Fort, built about 150 C.E.. Arab invaders established a military headquarters there in 642 C.E., which became the permanent base of the Umayyads and Abbasids, and contained the first mosque in Africa. When the North African Shiite Fatimid Dynasty conquered Egypt in 972 C.E., their leader, Al-Muez Ledin-Ellah, built a new capital north of the old settlement and renamed the city Al-Qahirah after the planet Mars that was rising on the day the city was founded. The Al-Azhar mosque, founded the same year, and its accompanying university, made Cairo a center of Islamic learning and philosophy. The Seljuks captured Cairo in the mid-1100s, and Saladin and his successors expanded the city further, including the construction of its massive Cairo Citadel. 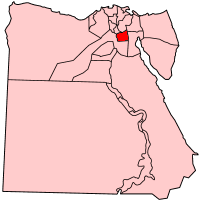 Egypt, with Cairo governorate highlighted. Modern Cairo remains the cultural center of the Arabic world, and millions of tourists from all over the world come every year to visit the ancient Egyptian monuments and temples and to see the antiquities in Cairo museums. While al-Qāhirah is the official name of the city, in local speech it is typically called by the name of the country, Mişr, pronounced Maşr in the local dialect. The name Al-Qahirah literally means "The Subduer," though it is often translated as "The Victorious." The name "Cairo" is believed to derive from the Arabic name of the planet Mars, "Al Najm Al Qahir," which was rising on the day the city was founded by the Fatimid Dynasty in 972 C.E. 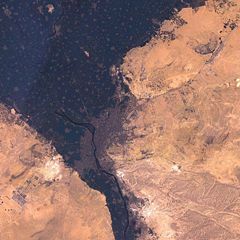 A simulated-color satellite image of Cairo, Egypt, taken on NASA's Landsat 7 satellite. Cairo is located on the banks and islands of the Nile River in the north of Egypt, immediately south of the point where the river leaves its desert-bound valley and breaks into three branches into the low-lying Nile Delta region. The oldest part of the city is somewhat east of the river. There, the city gradually spreads west, engulfing the agricultural lands next to the Nile. These western areas, built on the model of Paris by Isma'il Pasha (Ismail the Magnificent) in the mid-nineteenth century, are marked by wide boulevards, public gardens, and open spaces. The older eastern section of the city is very different: having grown up haphazardly over the centuries, it is filled with small lanes and crowded tenements. While western Cairo is dominated by government buildings and modern architecture, the eastern half is filled with hundreds of ancient mosques that act as landmarks. Extensive water systems have also allowed the city to expand east into the desert. Bridges link the Nile islands of Gezira and Roda, where many government buildings are located and government officials live. Bridges also cross the Nile attaching the city to the suburbs of Giza and Imbabah (part of the Cairo conurbation). West of Giza, in the desert, is part of the ancient necropolis of Memphis on the Giza plateau, with its three large pyramids, including the Great Pyramid of Giza (the only surviving “wonder” of the Seven Ancient Wonders of the World). Approximately 11 miles (18 km) to the south of modern Cairo is the site of the ancient Egyptian city of Memphis and adjoining necropolis of Saqqara. These cities were Cairo's ancient predecessors, when Cairo was still in this approximate geographical location. The current location of Cairo was too far from the ancient course of the Nile to support a city. Just to the south of the modern city's location are the ruins of Memphis, which was the capital of Ancient Egypt and was founded around 3100 B.C.E. by Menes of Tanis after he had united the two kingdoms of Upper and Lower Egypt. The capital later moved to Heliopolis, further south to Thebes; then, under the Ptolemaic dynasty, it moved to Alexandria. The first settlement on the location of modern Cairo was a Roman fort, known as Babylon Fort, built about 150 C.E.. It was built near the settlement known as Babylon-in-Egypt, which lay close to an ancient Egyptian canal from the Nile to the Red Sea. A small town mostly of Coptic Christians slowly grew around the fort. Arab invaders, led by Amr Ibn-el-As, took the fort town in 642 C.E.. They established their army in the location, rebuilding its defenses. The Arab tented camp outside the fortress, known as Al-Fustat, slowly became the permanent base of the Arab forces in Egypt under the Umayyads and Abbasids, and contains the first mosque in Africa. Slowly, the settlement grew into a small city. The North African Shiite Fatimid Dynasty conquered Egypt in 972 C.E. and built a new capital, Al-Mansureya, north of the old settlement. Their leader, Al-Muez Ledin-Ellah, renamed the city Al-Qahirah after the planet Mars that was rising on the day the city was founded. The Al-Azhar mosque was founded the same year, and along with its accompanying university it made Cairo a center of learning and philosophy. The school remains a major center for Islamic study today. The Seljuks captured Cairo in the mid-1100s, and Saladin and his successors expanded the city further, constructing the massive Cairo Citadel. The sack of Baghdad in 1258 C.E. heightened the importance of the city. It became the leading intellectual and artistic center in the Middle East, and perhaps the world, for the next 250 years. However, political power shifted from the Arab world north to the Turkic peoples and Europeans. The city was taken by the Ottoman Empire under Selim I in 1517 C.E., but the ruling Mameluks quickly returned to power as nominal vassals to the Ottoman Sultan. Napoleon conquered Egypt in 1798, and Cairo was quickly surrendered to him by its Mameluk rulers. Napoleon brought with him an army of scientists, scholars and artists to establish a French culture base in Egypt. They made the first European study of Egypt, published as Le description de l'Egypte. Napoleon left Egypt after his fleet was destroyed at the Battle of Aboukir Bay in August 1798, leaving Jean Baptiste Kléber (General Kléber) in charge. Kléber was assassinated in 1800 and the three-year French occupation had little lasting effect. The first westernization began under the successors to Mehemet Ali, with the introduction of a railway connection to Alexandria in 1851. Significant change, however, did not occur until the reign of Isma'il Pasha when, in 1863, construction of the Suez Canal brought significant numbers of westerners to Egypt. A network of gas lighting was installed by a French company and the railway lines were greatly expanded. In 1867, Isma'il visited Paris to attend the Universal Exposition of 1867. There he saw the newly redesigned city of Baron Haussmann and, with funds from a booming cotton trade, decided to rebuild Cairo on the model of a European capital. He hoped to accomplish this by 1869, when representatives from around the world came to Egypt for the opening of the Suez Canal. Rather than rebuild the old city, Isma'il elected to add a new quarter to the western section along the bank of the Nile. The project was carried out by Ali Pasha Mubarak and designed by the French urban planner Pierre Grand. A new area of luxurious villas and apartments was constructed and new government ministries were erected. Grand boulevards were opened through the old town and tram lines soon followed. The era of colonization which began in 1882 saw the continuation of the rebuilding of Cairo. A modern sewer system was installed and new suburbs such as Heliopolis were constructed in the desert. Cairo's population exploded, increasing from 374,000 in 1882 to 1,312,000 by 1937. The city was dominated by Westerners, however, and city planners tended to emphasize Christian cathedrals over mosques. Cairo remained the central city of Egypt throughout the period of British rule and afterwards. The twentieth century saw massive growth in the size of the city as peasants left the farmlands in pursuit of work in the factories and commerce of the metropolis. The city was especially burdened by refugees from the various wars with Israel: much of the population of the Sinai Peninsula and the cities along the Suez Canal left for Cairo between 1967 and 1978. 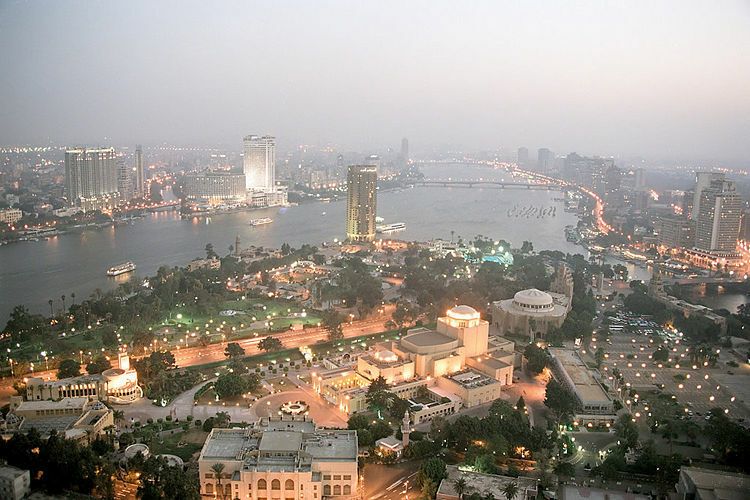 Today Cairo is Africa's most populous city and the Arab world's cultural center. Since the nineteenth century, Cairo has also become a center for tourism as people from around the world have come to see the monuments and artifacts of Ancient Egypt, especially the pyramids. Laws against the export of these treasures has meant that the Egyptian Museum in Cairo is the only place in the world that many items can be seen. For seven thousand years, Egypt has been a meeting place of civilizations. The Pharaohs, the Greeks, and the Romans left their imprints here. Muslims from the Arab Peninsula, led by Amr ibn al-A'as, introduced Islam into Egypt. Khedive Mohammad Ali, with his Albanian family roots, put Egypt on the road to modernity. Egypt can be likened to an open museum with monuments of the different historical periods on display everywhere. President Mubarak inaugurated the new Cairo Opera House of the Egyptian National Cultural Center on October 10, 1988, seventeen years after the Royal Opera House had been destroyed by fire. The National Cultural Center was built with the help of JICA, the Japan International Co-operation Agency and stands as a prominent feature for the Japanese-Egyptian co-operation and the deep-rooted friendship between these two nations. The joint efforts of Japanese and Egyptians have created a unique landmark which celebrates the rich and diverse cultural life, not only of Egypt, but of neighboring nations in Africa and the Middle East. The Khedivial Opera House or Royal Opera House was the original opera house in Cairo, Egypt. It was dedicated on November 1, 1869 and burned down on October 28, 1971. Egypt has enjoyed a strong cinematic tradition since the art of film making was first developed, early in the twentieth century. A natural progression from the active theater culture of that time, cinema rapidly evolved into a vast motion picture industry. Together with the much older Arabic music industry, it has helped to make Egypt the cultural capital of the Arab world. For over five hundred years, the history and scenery of Egypt have been featured in the works of Western geniuses including William Shakespeare, poet and dramatist John Dryden, novelist and poet Lawrence Durrell, and film producer Cecil B. de Mille. Since the advent of silent movies, Hollywood has incorporated Egyptian stories and visual effects in numerous box-office successes. Egypt has also produced some of the 20th century's greatest Arab writers, such as Taha Hussein,Tawfiq al-Hakim, and the Nobel Laureate, novelist Naguib Mahfouz, all of whom wrote for the cinema. Based on these cultural traditions, the Egyptian Association of Film Writers and Critics launched the first Cairo International Film Festival in Cairo on August 16 1976. For thirty-one years, Cairo has hosted international stars including Nicolas Cage, John Malkovich, Morgan Freeman, Bud Spencer, Gina Lollobrigida, Ornella Mutti, Sophia Loren, Claudia Cardinale, Victoria Abril, Elizabeth Taylor, Shashi Kapoor, Alain Delon, Greta Scacchi, Catherine Deneuve, Peter O'toole, Christopher Lee, Irene Pappas, Marcello Mastroianni and Omar Sharif, as well as directors like Robert Wise, Elia Kazan, Vanessa Redgrave, Oliver Stone, Roland Joffe, Carlos Saura, Ismail Merchant and Michel Angelo Antonioni, in an annual celebration and examination of the state of cinema in the world today. The Cairo Geniza is an accumulation of almost 200,000 Jewish manuscripts that were found in the genizah of the Ben Ezra synagogue (built 882) of Fostat, Egypt (now Old Cairo), the Basatin cemetery east of Old Cairo, and a number of old documents that were bought in Cairo in the later nineteenth century. These documents, written from about 870 to as late as 1880 C.E., have now been archived in various American and European libraries. The Taylor-Schechter collection in the University of Cambridge runs to 140,000 manuscripts; there are a further 40,000 manuscripts at the Jewish Theological Seminary of America. The manuscripts were narrowly rescued from burning by Islamic terrorists and zealots. Inaugurated in May 2005, Al-Azhar Park is located adjactent to Cairo's Darb al-Ahmar neighborhood. The Park was created by the Historic Cities Support Programme (HCSP) of the Aga Khan Trust for Culture (AKTC), an entity of the Aga Khan Development Network, and was a gift to Cairo from His Highness the Aga Khan. The city of Cairo was founded in the year 969 by the Fatimid Imam-Caliphs who were ancestors of the Aga Khan. During the development of the park, a part of the twelfth-century Ayyubid wall was discovered and subsequently restored. The wall had originally been built by Salah al-Din al-Ayubbi as a defense against the crusaders. The discovery prompted additional research into the nearby historic neighborhood of Darb al-Ahmar, and eventually led to a major project encompassing the restoration of several mosques, palaces and historic houses. The HCSP also established social and economic programs to provide a wide range of assistance for local residents. Evening view from the Cairo Tower. Cairo has a number of sporting teams that compete in national leagues. The best-known teams are Al-Zamalek and Al-Ahly, whose annual football Local Derby is perhaps the most watched sports event in Egypt as well as in the Arab world. Both teams are champions on the African continent and the Arab World, and play their home games at Cairo International Stadium, Egypt's largest stadium. The Cairo International Stadium, a multipurpose sports complex with a soccer stadium, an indoor stadium, and several satellite fields, has hosted several regional and global sporting events, including the African Games, and the Football World Championship for U17. Other athletic teams in the city include Al Jazeera Sporting Club, Shooting Club, Heliopolis Club, and several smaller clubs. Most of the sports federations of the country are located in the Cairo suburbs, including the Egyptian Football Association. The headquarters of the Confederation of African Football was previously located in Cairo before relocating to its new headquarters in 6th October City. Boutros Boutros Ghali - former Secretary-General of the United Nations, born in Cairo. Maimonides - Royal court physician to Saladin and Talmudic scholar. ↑ Aga Khan and Madame Mubarak Inaugurate Cairo's Al-Azhar Park AKDN, March 25, 2005. Retrieved May 17, 2016. ↑ Rescuing Cairo's Lost Heritage Islamic Monthly, January 1, 2006. Retrieved May 17, 2016. All links retrieved May 17, 2016. This page was last modified on 17 May 2016, at 16:44.